When I visited the National Gallery in London last week I knew I only had an hour to spare so decided to try and sensibly limit what I wanted to see rather than rush around trying to see as much as I could in the allotted time and end up really seeing nothing. I decided to visit the Impressionist paintings which were housed in rooms 43 to 46. They were awash with works by Degas, Monet, Manet, Renoir and the likes. I spent some time in front of The Large Bathers by Cézanne as I knew I was going to write about the Philadelphia Museum of Art version of the painting which is very similar to the one in the National Gallery. (See My Daily Art Display for March 13th). The reason for mentioning all this is not that I am featuring another Impressionist work today but that having passed through these rooms I arrived at Room 41 which was simply entitled The Academy. So why label this room as such? The answer is that It goes back to the first half of the 19th century and the academic teachings of École des Beaux-Arts, which was the official art school in Paris. The training that young aspiring artists received at this establishment was very taxing and their tutors made them spend long periods drawing. The students started by copying plaster cast statues and then later they would join the life classes. In some ways there art was regimented. It had to conform to the rules of The Academy. Their tutors only wanted to have them deliver what we now term academic art. I had thought that the title of this room would mean that it would be full of works by French painters but it was not. It was more to do with the style of paintings than the nationality of the artist and although there were a large number of works by famous French artists such as Corot, Delacroix, Géricault, and Jaques Louis-David there were some non-French contributors such as the Spanish painter, Francesco Hayez, the Danish painter Christen Købke and the German painter, Johann Philipp Eduard Gaertner. 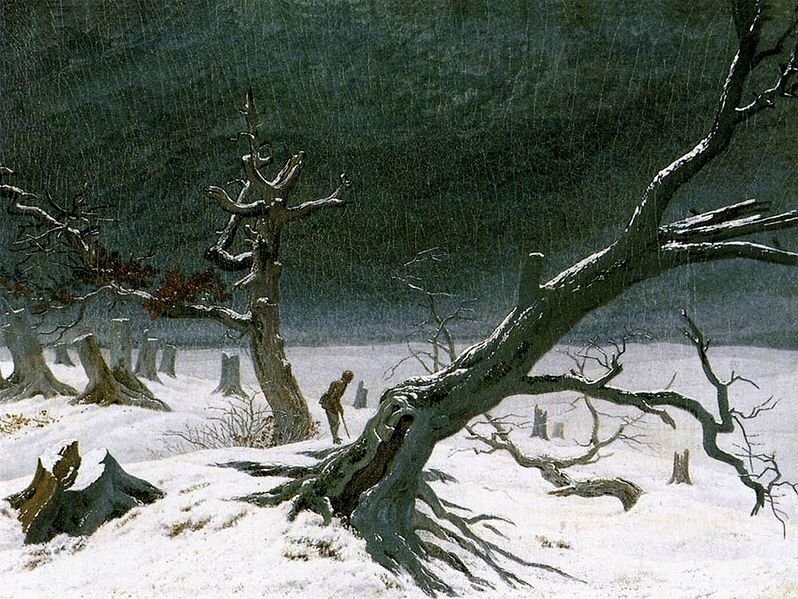 However I came across a painting in this room, entitled Winter Landscape, by one of my favourite artists, Caspar David Friedrich and it is this painting along with two of his other works, which are connected to this painting that I want to feature in My Daily Art Display blog today. Caspar David Friedrich studied at the Royal Danish Academy of Fine Arts at the end of the eighteenth century. This Academy is the oldest and most renowned place of higher learning in Denmark. Caspar Friedrich was one of the leading artists of the German Romantic movement. He specialised in landscape painting but with a difference. His aspiration as a landscape artist was not to be a topographical artist portraying true representations of what he saw but he wanted his paintings, as he once said, “to reflect the artist’s soul and emotions in the landscape”. He endowed his landscape works with symbolism and the natural elements in his work often took on a religious connotations. 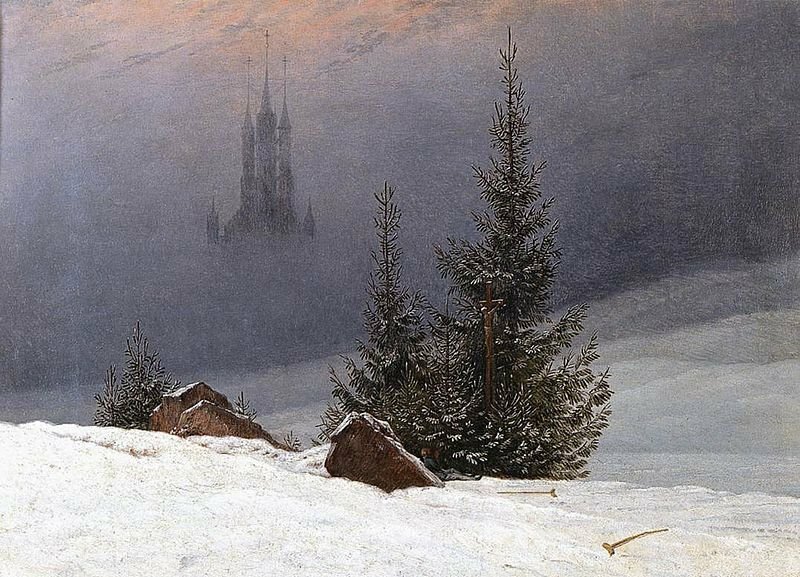 There is something about all Friedrich’s paintings which make them so evocative. I find his works of art breathtaking and I stood before this painting and marvelled how such a painting could exude an overwhelming feeling of both wonderment and awe. As we have seen with other artists, they would often paint a number of versions of the same subject. In some cases the difference between the various versions would be very noticeable in others the differences would not be so obvious. Two of today’s painting fall into the latter category. The two paintings, Winter Landscape and Winter Landscape with Church look almost the same, but not quite. To confuse things slightly I am also going to look at another work of his, also entitled Winter Landscape, which is almost a prequel to the other two. Sounds confusing? Let us take a look at each of the works. The oil on canvas painting, above, entitled Winter Landscape, can be found in the Staatliche Museum in Schwerin and was painted by Friedrich in 1811. This painting has an intense feeling of solemnity and pathos as we look out at a bleak winter scene with a snow covered ground stretching out as far as the eye can see. This melancholic depiction before us, with its threatening dark grey sky features a tiny old man, bent over and leaning on his two wooden crutches. He is standing between two gnarled tree trunks and into the distance we can see the stumps of trees which have been cut down. Some art historians would have us believe that we should interpret this as being symbolic of the end of life and see the painting as an allegory for the aged man coming to end of his life as the landscape and vegetation also have reached the end of their life cycle. So looking at this work are we to believe there is no hope for this man? Probably so, but then Friedrich decided to paint a companion piece. In fact that same year, 1811, he painted two companion pieces which follow up the story of the little old man. These two works depicted a tale of the old man’s salvation. One of the companion paintings was again entitled Winter Landscape and is housed in Room 41 of the National Gallery, London. This work was discovered in a private collection in 1982, and was acquired by the National Gallery five years later. The second one, thought to be a copy of the London painting, is entitled Winter Landscape with Church, and can be found in the Museum für Kunst und Kulturgeschichte (Museum of Art and Cultural History) in Dortmund. 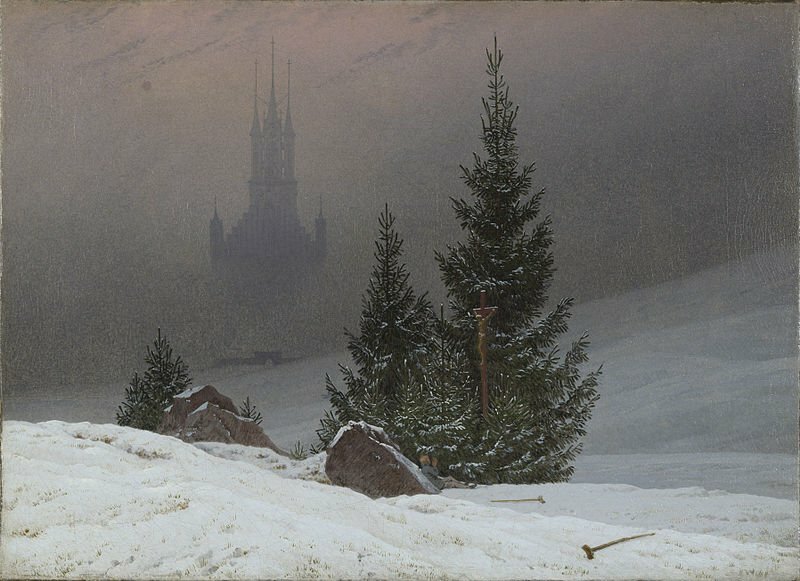 In both of these paintings we see that Friedrich has introduced, for the first time in his art work, a Gothic church, which can just be seen emerging out of the misty backdrop with the somewhat red-streaked threatening winter sky overhead. In the mid-ground we see a man leaning back against a boulder and is probably the same man we saw leaning on his crutches in the previous work. He had arrived at the end of his journey and we see him gazing up, in prayer, at the crucifix which is positioned in front of a cluster of young fir trees. The figure of Christ on the cross looks down upon him. In the foreground we see his crutches lying in the snow, which we presume he has discarded. The abandoned crutches and the man looking up devotedly at the crucifix are interpreted as the man’s blind faith in his Christian beliefs and his feeling of security he has derived from those dearly held values. In the first painting we looked at there is little to see but dead trees and stumps of once large ones. We felt for the crippled man as he stood bent over his crutches in that wintry landscape and in a way we grieved for his unwanted solitude and wretchedness. However in this scene before us now we see him in prayer and for him, we begin to realise he has reached the place he wants to be. The mood of the painting is so different from the previous one. The snow is the same. We still almost feel the coldness of the scene but the atmosphere has changed. The once hopelessness has been replaced with a degree of hope. The figure of Christ on the cross is symbolic of the hope that his resurrection would bring. No longer does the man feel the necessity of wooden sticks to act as crutches. The only support he wants is that given to him by his belief in Christ. Looming on the horizon we see the facade of the spires of the grand Gothic church which reach toward the heavens, the silhouette of which has a marked similarity to that of the fir trees. These trees along with the rocks we see appearing from beneath the snow in some ways symbolise faith and the large Gothic church, which appears to be rising from the ground, is symbolic of our belief that there is life after death. Friedrich used few colours in these two paintings as he was more interested in the graduating tones of the few colours he used. On a close examination of the actual paintings we are able to see that the misty but iridescent background has been achieved by stippling. Stippling, in this case, is the creation of shading by using small dots. The dots are made of a pigment of a single colour, and for this work the artist has used, the blue pigment, smalt, and has applied it with the point of a brush. The London version of the painting is different to the version in Dortmund in as much as Friedrich has shown small blades of grass pushing up through the melting snow. This symbolises hope and rebirth. Also in the London version of the painting Friedrich has added an arched gateway in front of the church. In November 1811 Friedrich sent these three works along with six others to an exhibition in Weimar. This was the largest group of works shown by Friedrich so far. The works were admired by a number of critics and poets, writers and famous figures like Goethe and Ludwig Tieck but they had their detractors who were opposed to the way Friedrich treated religious subjects and landscapes.